Hair will be neat and clean and present a groomed appearance. Hair above the ears and around the neck will be tapered from the lower hairline upward at least 3/4 inch. May not interfere with proper wearing of the headgear. Clean shaven face. Cadets may not have a mustache or beard. Hair color should be natural and complement the individual. Bulk Not Greater than 2 inches. Sideburns must not fall below the middle ear. Hair must be neatly arranged and styled to present a feminine appearance but may not fall below the lower edge of the uniform collar. The only ornaments permitted in the hair are bobby pins (inconspicuously arranged) and barrettes (two maximum) of a color that matches the hair. Fingernails must not exceed 1/4 inch measured from the tip of the finger. Nail polish must be a soft shade, complementary to the skin tone. Cosmetics should be of conservative color and applied sparingly. No eccentricities or faddishness of dress, jewelry, or grooming is permitted. Earrings must be the 6-mm ball (approximately 1/4 inch) type with a brushed matte finish; either the screw-on or post type may be worn. Silver. While in uniform, women may wear one necklace or choker; but it must not be visible. Adherence to these grooming standards is MANDATORY. Sleeves may be rolled, during times of warm weather on the Camouflage Utility and Navy Working Uniforms. 1. Lay the uniform on a flat surface, face up and sleeves extended out. Button the button at the end of the sleeve to the largest setting. 2. Roll the sleeve inside-out in three inch rolls upwards for five to seven rolls, depending on arm length and roll is approximately 2 inches above elbow. button at the end of the sleeve unbuttoned. 2. Flip the sleeves inside-out by folding the cuffs of the sleeve up towards the armpit area. Pull it up until it almost touches the inside seam of the armpit region. 3. Roll the bottoms of the inside-out sleeves in three inch rolls upwards until you reach the cuffs. 4. Fold the end of the cuff down over the rolled portion of the sleeve. 5. Secure the button and flap. Repeat on opposite sleeve. The black silk neckerchief is worn by NSCC male and female cadets with all jumper-style tops. 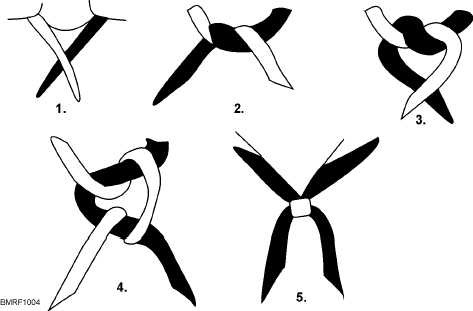 Wear the rolled neckerchief with a large square knot, tied at the bottom of the V-neck opening of jumper, with ends of the neckerchief even. The upper edge of the knot should be even with point where the collar opens. When the dress uniforms are pressed, make sure the uniforms are inside out so that the creases are inverted when you put it on. Jumper and trousers (whites and blues only) are NEVER creased from the outside. ALWAYS turn the jumper and trousers wrong-side out as shown below. The JUMPER is folded down the middle with the collar flap extended. Lie the jumper back down and fold the right sleeve across the front and match it up with the left sleeve. Smooth the jumper out so the crease extends evenly from the top of the collar with the bottom of the waist band. Use a damp piece of sheet between the hot iron and the fabric. The damp cloth creates steam that sets in a sharp crease. Begin ironing along the back of the jumper as seen in the picture (second on right), moving from the tip of the collar all the way down; then crease the sleeves while still folded in half. Unfold the jumper so it lies flat on its back. You should see an inward crease extending from the V-neck down to the waist band. Make sure there are no multiple creases. Fold both sides of the collar flap in toward the center crease and using the dampened cloth, carefully iron the creases in on both sides (be careful not to iron out the center crease. There should now be three sharp creases in the collar flap with an equal distance between each crease. TROUSERS: Fold the trousers wrong-side out and lie them flat on the ironing board seam to seam. When finished, the two creases will run along the outside edge of the pant leg, NOT THE FRONT, with the corresponding crease running along the inseam. When ironing is completed, you can turn the uniform right-side out and you should see that all creases EXCEPT the front middle crease and the three creases on the collar flap are turned inward, not out. Male Dress Blues are done the same way. Females do not wear the dress blue jumper and trousers. Females do wear the dress white jumper and trousers though. 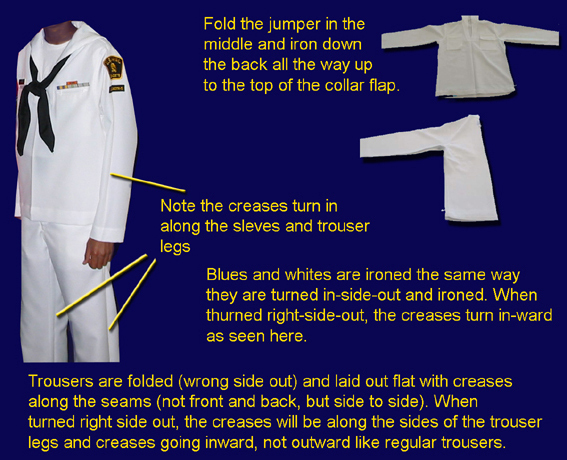 Sea Cadet Dress blues MUST be professionally dry-cleaned. Never wash your dress blues in a washing machine. Do not let the dry cleaners press your uniform. They will press it in incorrectly. Dirt and other debris can easily embed into leather. Therefore, your shoes or boots need to be cleaned before polishing. Use a damp cloth to remove excess dirt and debris. To polish your shoes effectively, always remove the shoelaces from your shoe before you start polishing your shoes. This is the best way to get to clean the tongue of the shoe and avoid staining the laces. Shoe polish or creams should be applied evenly with a brush or soft cloth. Once the polish has properly dried, simply buff to a brilliant shine using a natural bristle brush. Note: it is important to use a separate brush and cloth for applying and buffing different colored shoes. Cadets are not authorized to wear patent leather shoes.